Use a white wine that you’d want to drink after opening. And for those of you looking to speed things up, you don’t need to slice the green beans, but the extra work is worth the effort. Cook the green beans in a pot of well-salted boiling water for about a minute, just long enough that they lose their raw edge. Drain and immediately immerce in ice-cold water to stop the cooking. Drain again and set aside. In a small bowl cover the raisins with scalding hot water for five minutes, drain and set aside. Heat your largest skillet over medium heat. When the pan is hot, add the oil, garlic, onion, and bay leaves. Cook for 5 minutes, or until the onions and garlic start to brown just a bit. Add the wine and cook until it has mostly evaporated. Carefully remove the bay leaves. Stir in the paprika, cumin, coriander, curry powder, salt, crushed red pepper flakes. Stir in the tofu and raisins and cook until heated through, a minute or so. Add the butter and green beans and stir until the butter has melted. 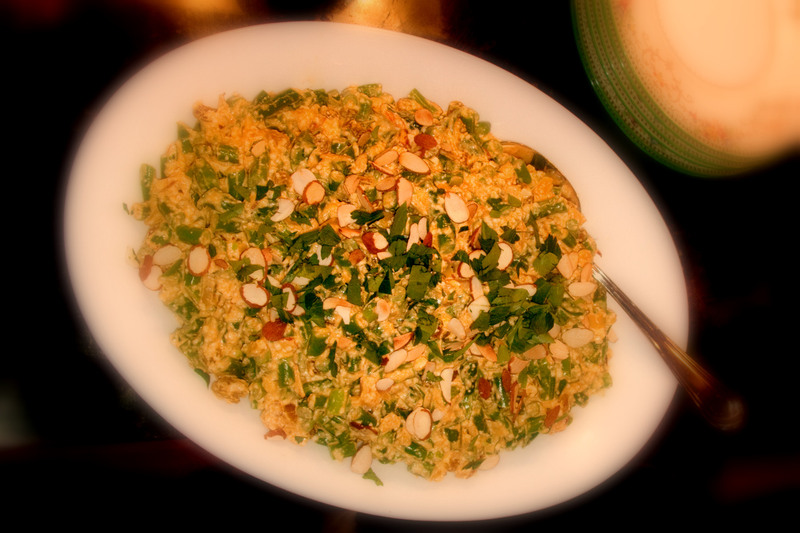 Remove from heat and stir in the crème fraîche, then most of the almonds and most of the cilantro. Taste and add more salt and some pepper if you like. Serve topped with any remaining almonds and cilantro.